Rockville lawyer Michael Morgenstern discovered that when Prashant Kumar, the passenger of a Toyota Tercel, slid forward under his seat belt in a head-on collision, lost most of two legs and shortened his life expectancy to age 50. The driver escaped unharmed. Mr. Morgenstern convinced a jury that Toyota Motor Corp. should have provided some kind of visible warning that seat belts may not restrain properly if the seat is reclined. Then Mr. Kumar offered to return half of the $59.8 million verdict if the automaker agreed to print that information on warning stickers for their vehicles. Toyota refused, choosing to appeal instead. "We don't have any plans to install warning stickers," said Toyota spokesman Joe Tetherow. It is necessary from both a safety and comfort standpoint, he said, for the front passenger to be able to recline "as occupants of all sizes and shapes should be able to sit safely in the passenger seat with their safety belt properly fastened." Mr. Tetherow said Toyota is not aware of any testing or studies that Mr. Morgenstern has conducted to support the need for warning stickers. In fact, Mr. Morgenstern's stickers may distract from the federally mandated air-bag visor warning required in all passenger cars, Mr. Tetherow said. So Mr. Morgenstern has taken on a personal crusade to educate as many motorists as possible. He has printed 2,000 of his own dashboard stickers at a cost of $5 each and is sending them out to clients, associates, friends and anyone who requests one. "I think there is a moral, ethical component to this," Mr. Morgenstern said, noting that no car companies use warning stickers. "It is my wish that consumers realize the danger." 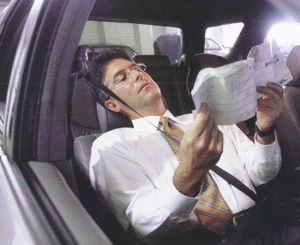 Most passengers at some point have pushed back their seats to take a nap or relax during a car trip. The problem is that while the lap belt remains secure, the shoulder strap does not move back with the passenger. Mr. Morgenstern recommends, "You pull the car over to a rest area and put the seat back then and catch some sleep that way." Mr. Kumar did not do that. When the Tercel struck another car in New Jersey four years ago, he "submarined" forward, crushing both of his legs above the knee. He was in a coma for three weeks and required 12 surgeries, including double amputation, by the time the case went to trial in Baltimore in May 2000. The force of the collision has damaged Mr. Kumar's kidneys, liver, lungs and other parts of his body, and he requires surgery about every six months. At the three-week trial, attorneys for Toyota contended that a warning in the owner's manual was sufficient. The jury, after three hours of deliberation, disagreed. "After the verdict was given, we sat down and said, 'Look, sure the money was great ... but the message needs to be heard about this serious problem,'" said Mr. Kumar, now 29 and a sophomore at Frostburg State University. "I don't want anyone to go through what I went through." We serve the following localities: Frederick County, Fort Detrick, Frederick, Middletown, Mount Airy, Thurmont, Montgomery County, Aspen Hill, Bethesda, Cabin John, Chevy Chase, Clarksburg, Colesville, Damascus, Darnestown, Arlington County, Arlington, Fairfax County, Alexandria, Annandale, Bailey's Crossroads, Burke, Centreville, Chantilly, Clifton, Falls Church, Great Falls, Lorton, Merrifield, and Reston.